A multi-purpose food bin with a large 140 litre capacity. Combo is a multi-purpose food waste bin with a large 140-litre capacity. 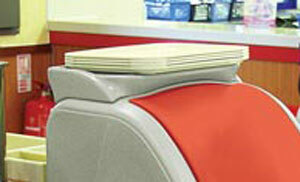 The bin has smooth contours to ensure there are no dirt traps and to allow easy cleaning. Its durable construction makes it ideal for use both indoors and outdoors. Choice of aperture flap or open front model. Bin Body: Black, Cool Light Grey, Dark Blue, Deep Green, Red. Door: Black, Cool Light Grey, Dark Blue, Deep Green, Red. Flap: Black, Cool Light Grey, Dark Blue, Deep Green, Red. What is this? Tray Top.